Every girl dreams of a Royal Wedding - that her Prince charming will come and take her to the palatial royal abode. Royal Wedding Tour realizes such a luxurious dream amidst the utopian settings of Udaipur where heritage of Rajputs reside amidst lakes. India is known as the land of a thousand faces and a country with an ancient civilization that overflows with cultural richness. With a blend of numerous languages, religions, traditions and cultures, India has to be the most diverse country on earth. In a land so varied, the possibilities for a marriage are endless with a plethora of breathtaking and historical locations to choose from. Whatever your preferences, a wedding in India is bound to be cherished forever. Amongst the numerous possibilities, we specialize in re-creating royal weddings just the way the Maharajas would have done it, with all the pomp and glamour including original royal pavilions and thrones for the bride and groom. Set against authentic backdrops of Grand Heritage Palaces and Royal Retreats, the bride and groom can exchange vows in truly regal surroundings. We organize everything from grand processions with highly decorated elephants, camels and horses accompanied by authentic folk singers and musicians to designing of wedding cards, clothes etc. The Taj Mahal was built as a symbol of love, and is undeniably one of the most beautiful monuments on earth. The desert palaces of Rajasthan interspersed with timeless cities, the most memorable being the 'Venice of the East', Udaipur offer idyllic locations for marriages. Add to this snowy mountains, golden beaches, ancient ruins and tropical backwaters... it is no surprise India has been seducing visitors for centuries. » All travel and accommodation arrangements for family and guests. » Wedding clothes for family and friends. » Organizing entertainers like DJ's, singers and folk troupes required for various functions. » Decor at each function, special floral decorations and table layouts. » Identifying caterer, decorator, and photographer or filming crew. 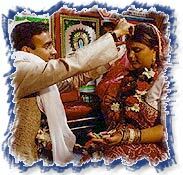 If any special or other services are required simply let us know and we will be happy to arrange them for you. This is a suggested itinerary, aimed at capturing the true essence of a Royal Indian Wedding and set in royal venues. Combining all essential functions i.e. Mehndi, Sangeet and Wedding Ceremony. A separate hospitality desk is set up at the reception for the wedding function to assist guests. Lunch for all guests organized at the Shiv Niwas Palace Courtyard. Along with a welcome drink, every guest receives an activity schedule of the Regal Wedding with details of events. Mehndi night at the Zenana Mahal with performing artists. Lunch served at the Darbar Hall. The magnificent hall has in the past, hosted many formal Darbars and Royal Weddings. An evening at Risala. The Risala brings alive the hustle bustle of a village bazar -a special theme for the evening. Dinner at Sunset View Terrace -part of the Fateh Prakash Palace, it overlooks the Lake Pichola and the magical Aravalli Mountains. Day is at leisure. Lunch organized either at Shiv Niwas Palace Lawns or at the Promenade. Night of the wedding. In the early evening gentlemen gather at the Darbar Hall, for tying Safas, while the ladies get all the help they need from our staff. All guests assemble at Shiv Pole or Fateh Pole. The Royal Procession begins as girls dressed in Rajasthani attire sprinkle rose petals and rose water in front followed by Dhol / Nagada. The entire procession route is lined with men in uniform and lancers and the route is lit with mashaals. Guests are ushered into decorated boats to be ferried across the lake to Jagmandir, the island palace. 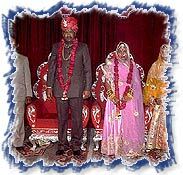 Wedding ceremony is performed at Jagmandir with a spectacular fireworks display. Guests prepare to leave with fond memories of the Regal Wedding. Our hospitality staff ensures that the coaches/cars are ready to transfer guests to the airport or railway station.